The incidence of Lyme disease in our area of Pennsylvania is increasing rapidly. There is a new product on the market to help prevent this insidious disease. Rid-A-Tick is a new product sent to me by a new member of the Pennsylvania Outdoors Writers Association for review. Click here to read the full story. Rid-A-Tick has won the 2004 Pet Product News Editors' Choice Award. It may seem early to be discussing ticks. After all, what self-respecting parasite would be caught flitting about amid ice-covered fields and sub-zero temperatures, right? But the tick season in Maine will be here before you know it. And, ticks, and the Lyme disease that they can cause, is becoming an ever-increasing welfare concern for those of us who enjoy the outdoors. From all reports, including veterinarians, eastern and northern Maine is experiencing unprecedented problems with ticks. In fact, Lyme disease has now become one of the fastest growing epidemics to date. The alarming increase may be partly attributable to what the center for Disease Control refers to as an "under reporting" of cases. Instead of the 30,000 cases a year previously reported, the CDC has now issued a statement that the numbers are more in the range of 300,000 cases a year. 96% of these cases were reported from 13 states. According to the CDC, Lyme disease is now the most commonly reported vector-borne illness in the United States, and that the new estimate suggests that the total number of people diagnosed with Lyme disease is roughly 10 times higher than the yearly reported number. Last fall, after a day bow hunting for deer, I found a tick embedded deeply into my skin while toweling off after a shower. Nothing new. I have picked them off before, but it is not always easy to extract the entire critter when they are embedded deep. Then you always wonder if you got it all, or if there is still some nasty residue lurking beneath the skin to attack your blood stream. Recently, I got a call from Tom Martin, an entrepreneur from Minneapolis. Martin has a new product that should interest anyone concerned with safe tick removal, not only off of themselves but pets as well. The product is called Rid-A-Tick. Advertised as a “safe and easy tick removal system, Rid-A-Tick is simply an adhesive patch, or medical tape, that you place over the tick while it is still in your skin or your pet’s. The patch, in effect, smothers the air-breathing tick and forces it to back out from your skin. After a few minutes, the patch is removed taking the tick with it. The patch can then be disposed of along with the tick. Or, the patch and the tick can be saved for medical examination if that is called for. The other good thing about the Rid-A-Tick patch is that it separates the human hand from the tick thus preventing any transfer of blood from person to person, or pet to person. More information on this new product is available at the Rid-A-Tick website: www.ridatick.com. The author is editor of the Northwoods Sporting Journal. He is also a Maine Guide and host of a weekly radio program "Maine Outdoors" heard Sundays at 7 p.m. on The Voice of Maine News-Talk Network. He has authored three books. CDC Reports a 40% rise in Lyme disease. Dennis Anderson reviewed Rid-A-Tick on 3-5-04. Robert Ehlers, Racine, WI: "While rabbit hunting, I applied the easy-to-use Rid-A-Tick patch on a tick embedded into one of my basset hounds. In just minutes the tick simply backed out. What a great idea!" 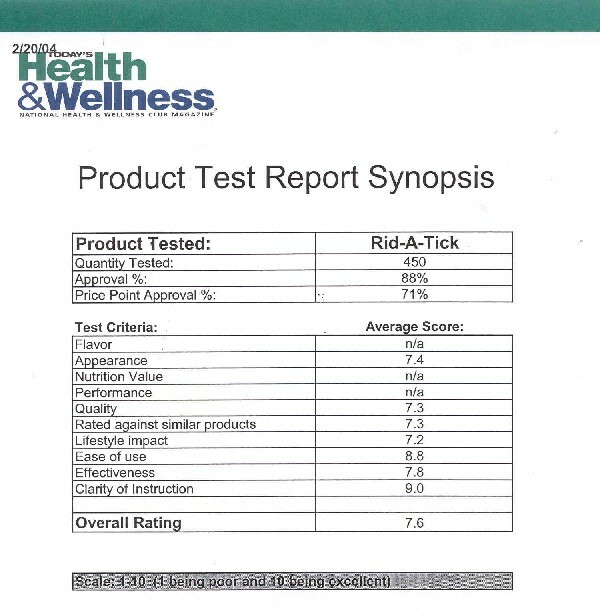 Timothy Braun, Neenah, WI: "Rid-A-Tick proved to be an easy way to remove a tick from my 5-year-old child. My son wouldn't let me near him with a pinching tweezers, but a cool-looking sticker was no problem. Rid-A-Tick made the job painless for both of us."